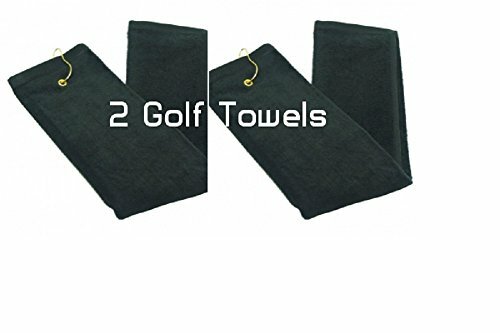 The Tri-Fold Golf Towels make an excellent addition to any golfer's bag. These towels are 100% cotton terry cloth that comes with a grommet and bag clip to attach easily to any golfer's bag. This package contains 2 Golf Towels. Always have a spare. TRI-FOLD ABSORBENT: Extra large 16" x 25", helps you clean up well. This superb golfing accessory allows you to keep your equipment clean and free from dirt. A BLACK TRI - FOLD GOLF TOWEL looks professional, which is exactly what you want when you're out on the Golf Course. THESE PREMIUM QUALITY golf towels are made of 100% cotton terry-cloth, high quality and durable. THE GROMMETS on our black terry velour golf towels are sturdy, and will securely hold your golf towel to your bag. THE CARABINEER CLIP and metal gromment attachment can easily attach around anything such as your bag, cart, or your push cart. These towels also work great for fisherman. Just clip them on your boat and clean the hands after catching your fish. If you have any questions about this product by Show Car Guys, contact us by completing and submitting the form below. If you are looking for a specif part number, please include it with your message.